Dr. Mirley Balasubramanya (Dr. Bala as he is known) is a mathematical physicist with interests in the applications of mathematics in physics. He has worked on extensions of Hamilton-Jacobi theory in quantum mechanics. In classical mechanics Hamilton’s equations of motion remain invariant under canonical transformations. The classical Hamilton-Jacobi theory situates the dynamics of the system in the generator of the canonical transformation. Its strength as a formulation of classical mechanics is the similarity it brings to the dynamics of both particles and waves. This was of particular use in the early days of quantum mechanics when physicists sought a segue from the classical world to the quantum world. A variation on this formulation makes use of a transformed set of dynamical variables that consists of constant momenta, called action variables, and corresponding coordinates that vary linearly in time. This formalism is especially useful for the study of perturbations of mechanical systems. There is a corresponding quantum version of the Hamilton-Jacobi theory that has the quantum action variable as the central construct. 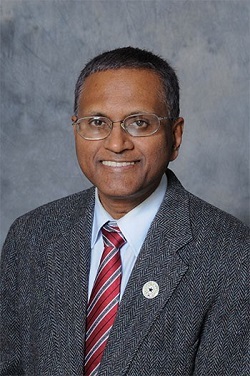 Dr. Bala’s research is related to several aspects of this alternate formulation of quantum mechanics, including problems on scattering and extensions to relativistic quantum mechanics.